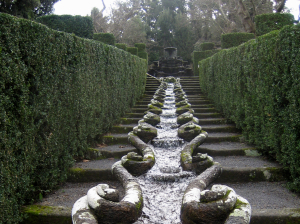 Water – liquid silver in the Italian Garden. 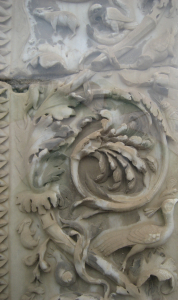 Come and experience water as a dramatic part of Italian Renaissance gardens. Water flows, gurgles, pauses, rushes, sprays, leaps, sings, sleeps in the Italian garden. The gardens we will visit were built on hillsides, using gravity to provide almost unlimited variety of water works. Often natural springs were the source of the water but, for some of the gardens, one or more rivers were diverted to provide the amazing displays. We will be experiencing the water in the gardens and using this inspiration to tap into our unconscious in our art meditations. Marble detail showing the patina of age. Am I showing my patina of age as I try to refine the details of this website? I love a steep learning curve and have enjoyed being immersed in learning about Word Press, Business FaceBook, domain names, Twitter, Pinterest and all the other details of sharing my love of quiet gardens with the world. I’ve stayed up much too late! Each new detail I master wakes me up enough to entice me further down the path and delays bedtime.